Our advice is that if you would like to explore how having an insurance plan for your business can be an advantage to your business, that you sit down with an insurance broker and go over your options. Over the past several years of working with my California clients and potential clients, there have been a few, to say the least, “special” situations we have dealt with. In the past year, our website has been busy with requests from California businesses looking for insurance coverage of all sorts. These requests come from new start-up companies, and some of the most unusual ones come from companies that have been in business for years but have never acquired insurance, which, to us, is just incredible. One particular request that our agency received was from a company that had been in business for well over 6 years, and its business was to install equipment that the public would be using on a daily basis. It is well known that anytime the public uses any type of machine could result in a situation where a lawsuit is just waiting to happen. In discussing the potential client’s insurance needs, it was evident from the start that this business owner was having a difficult time comprehending a scenario where he would ever need an Orange County General Liability Insurance policy. He explained that the only reason he was even considering any type of insurance was because a major client that he wanted to do business with made it mandatory that he have insurance and provide them with a certificate of insurance as evidence of coverage. After consulting with the client about his company’s insurance needs and conferring with several carriers about this risk, we came to a decision to pass on quoting their insurance. Most of the carriers we did discuss this account with declined to even provide us with a quote when we informed them that client had been in business for over 6 years and never acquired General Liability insurance coverage. Please be aware that insurance companies do not look favorably on companies that have been in business for years without insurance, and quite a few will not even offer any terms at all. A few carriers that agreed to look at this risk informed us that their terms would come with higher rates, and there would be several strict exclusions to protect them from a potential claim considering that the client had no prior coverage. Another time, a company that we were familiar with, who had a well known name, and had been in business for several years, contacted us to look for an Errors and Omissions insurance policy for their company. At first, we thought that they already had this type of coverage and had decided to either shop for a new carrier, or broker, or both. It turned out it was none of these since they never had E & O coverage before. This particular business deals in the information sector and does have a General Liability Policy, but in this case, the GL policy will not provide coverage for their company should a lawsuit be filed against them for their professional work. In this case, we were searching for a carrier that would fit their needs, and, again, we were running into the same problem. Several carriers declined to quote based on the fact that the client had no previous coverage, and the few who agreed to quote have told us the rates would be higher, and, in fact, they were treating the business as new in business even though they had been operating for some time. In discussing a course of action with new business owners, we press upon them just how important it is to acquire the proper type of insurance when they start out, and how it is in their best interests to do so. By making insurance part of your business plan, it can help in two ways with the first, of course, being that an insurance policy will protect your business from the unexpected things that could adversely affect your company, and the second reason is that you will be building a record with the insurance carrier that can be followed. What this means is that each consecutive year your company has insurance, and, hopefully, there will be no claims, your company stands a very good chance of having better rates on their insurance, and if you decide to switch your coverage to another carrier since you have a track record, your business will be attractive to other carriers. Our advice is that if you would like to explore how having an insurance plan for your business can be an advantage to your business, we suggest that you sit down with a seasoned and professional insurance broker and go over your options. 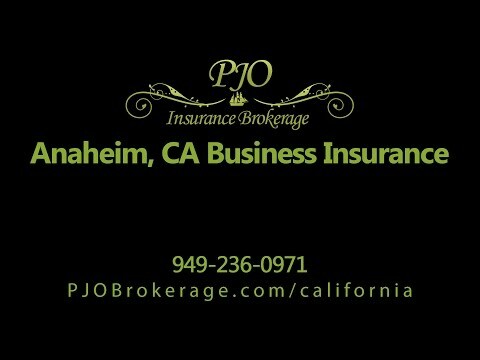 The experienced CA insurance brokers at PJO Insurance Brokerage would be more than happy to help you through this process.